He and Susan appeared on the Blue Streak many times over the 10 years I’ve been doing this blog. This post includes some of the photos of them from previous posts. The afternoon service last Friday was perfect. Arthur would have loved it. Four friends of his — representing different aspects of his life — paid tribute. And the Very Rev. John C. Ross, the dean and senior pastor at St. John’s, also made moving personal remarks, calling Arthur “an Episcopalian’s Episcopalian” due to his devotion to the church and the faith. Former Knoxville Mayor and Ambassador to Poland Victor Ashe grew up with Arthur in the Melrose neighborhood of West Knoxville, now a part of the University of Tennessee campus. He told stories about the two of them as children, including a report of how he, Arthur and other neighborhood kids spent some fun afternoons after school throwing crab apples at passing cars and narrowly avoiding getting into trouble. Former U.S. Attorney John Gill was a member, along with Arthur, of a Knoxville book club called The Irving Club, founded in 1886 and consisting of civic leaders. He described Arthur as a voracious reader and related that Arthur’s library at home had books stacked to the ceiling and on the floor under furniture with a couple more opened and balanced on the arms of an easy chair — the only furniture in the room except book cases. “He might have had a refreshing beverage nearby as he enjoyed the books,” Gill allowed. Arthur and Susan “cutting the rug” in 2012 at the 70th birthday party of former Knoxville City Councilman Larry Cox at Kerbela Temple. It seems that everyone has an Arthur story. Litton’s restaurant in Fountain City paid tribute to him shortly after his death with a message on its sign: “RIP Arthur S.” Matthew McClellan, proprietor of the men’s clothing store bearing his name in Bearden, says Arthur was a regular there on Saturday mornings. He always held court in an easy chair in the store. McClellan plans to have a commemorative plaque with Arthur’s name put on that chair. Victor Ashe and Arthur at a New Year’s Eve party in 2017 at the John H. Daniel Company. Alan Carmichael and Susan Seymour at the same party. Dorothy Stair with Arthur at the Knoxville Museum of Art in 2015 at the wedding of her son, Marshall Stair, and Natalie Robinson. Alan, Arthur and former Knoxville Mayor Daniel Brown at the Green Thumb Gala at the Knoxville Botanical Garden in 2015. Alan and Arthur on New Year’s Eve 2013 at a party at Bette and Richard Bryan’s house. Arthur with a dogwood tree during our trip to Sewanee in 2013. At Crossroads Cafe in Sewanee in 2013. Terry and former Knox County Commissioner Thomas “Tank” Strickland with Arthur at the Green Thumb Gala in 2012. Arthur with Sherri Lee at Symphony in the Park at Ijams Nature Center in 2012. Arthur and Susan with state Sen. Becky Massey at the Front Page Follies in 2012 at the Knoxville Convention Center. Susan and Arthur with former Knoxville City Councilman Gary Underwood and Karen Schnupp at Larry Cox’s birthday party in 2012. At Gov. Bill Haslam’s inauguration in Nashville in 2011. 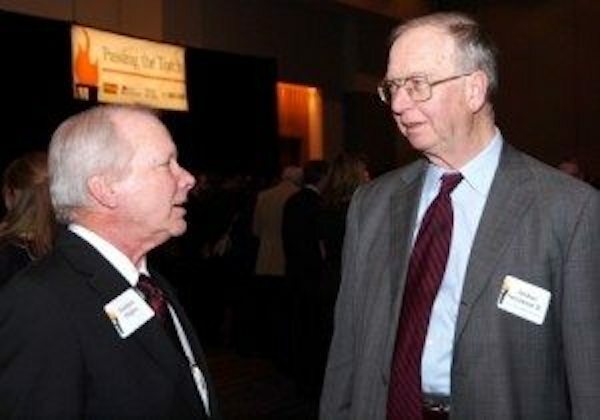 Arthur with Norman Majors at a welcome reception for new University of Tennessee President Joe DiPietro at the Convention Center in 2011. Arthur and Susan at a New Year’s Day party in 2012 at the home of Madge and Barry Cleveland. Filed under: Knoxville. Bookmark the permalink. ← Dining on pinto beans at Blackberry Farm. No kidding. Arthur was a special person. He had many friends that will miss him very much. He was Knoxville in many respects, the best traits of Knoxville. I am surprised you were able to photograph Arthur so many times without his trademark hat. Arthur was a great gentleman and a lover of the arts. He was a faithful attendee for KSO Masterworks concerts and we will miss him being in our audience. I’m glad I had the chance to know and work with him. Alan: I agree about how special he was. There is a huge hole in the Knoxville community now. Rachel: I was so glad to share his involvement with the KSO with him. And the fact that the KSO was represented at his beautiful service with a fabulous quartet made the day so much more special. Thanks for your thoughtfulness in providing that lovely touch. Beautiful tribute to a great friend. Arthur and Susan are special people. I didn’t know Arthur as long as some, in fact we first crossed paths in January of 2018 when Covenant Health retained his services to help us with a zoning issue. Arthur was always the consummate Southern gentleman and lawyer, but he was also fun, just like his parting adieus. He was always so warm and considerate of not only me, but others in our organization. Larry: Obviously, Arthur cared a lot about you, as well. And he sure did seem to enjoy your birthday party! Sharon: Thanks. They are the best. Patrick: I’m so glad you got a chance to know Arthur. You could see in that short time what a great community asset he was. I learned a lot about him at the celebration of life service, as it is called in the Episcopal Church. Very layered individual. More than the timeless fedora hats. This tribute to Arthur is perfect. I will miss him each and every month during the Planning Commission Meetings- he was always very respectful and thoughtful even though at times we may have disagreed. His colorful personality brightened up the stark room. He will be missed. This is a message to Arthur in heaven. “Have fun. We hope to catch up later”. This is a great tribute. The service had the perfect combination of serious and humorous moments, just like Arthur. We were adversaries several times over the years and I will always remember those cases. Georgiana: I learned a lot about him, too. It was a great assortment of folks from different aspects of his life. Very interesting. Gayle: I don’t see how the Planning Commission can ever be the same. Thanks for your kind remarks. James: Your comment brought tears to my eyes. Celeste: I can’t think of a more worthy opponent for Arthur than you! Cynthia – Thanks for a wonderful tribute column. Arthur’s friends described him perfectly. When I was with Moxley Carmichael, I had the opportunity to work closely with Arthur on a large project involving a vote from County Commission. As you know, we worked nights and weekends with Arthur and during that time we became friends. When I left MC, Arthur stayed in touch with me, which meant a lot to me. What I believe is if you were friend of Arthur’s, you were a friend for life. That’s quite a feat for anyone. He is missed.